The North American Flyball Association, Inc. (NAFA®) was established in 1984, when 12 flyball clubs in Michigan and Ontario banded together to guide the development of flyball in North America. Today, with over 400 active clubs and 6,500 competing dogs, NAFA is recognized as the world's leading authority on flyball and the sport's top sanctioning organization. NAFA is a nonprofit organization. Flyball got its start in the late 1960's and early 1970's, when a group of dog trainers in Southern California created scent discrimination hurdle racing, then put a guy at the end to throw tennis balls to the dogs when they finished the jump line. It didn't take long for the group to decide to build some sort of tennis ball-launching apparatus, and the first flyball box was born. Herbert Wagner is credited with developing the first flyball box, and apparently he did a flyball demo on the Tonight Show with Johnny Carson that got a lot of peoples attention. 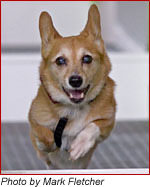 Subsequently, the new dog sport for dog enthusiasts was introduced in the Toronto-Detroit area by several dog training clubs. After a few small tournaments were held in conjunction with dog shows, the first ever flyball tournament was held in 1983. Mike Randall wrote the first NAFA rulebook in 1985, and was also the first NAFA Executive Director. The first head judge was Dave Samuels. Jump height is determined by the smallest dog on the team – this dog, called the "height dog", is measured at the withers, then that number is rounded down to the nearest inch and another 5" is subtracted to get the jump height (with the minimum jump height being 7"). So a 13 1/4" dog would round down to 13", minus 5", would jump 8". Maximum jump height is 14". In the early days of flyball, there were no start lights and no passing lights. All of the starts and passes were called by the line judges, who also used hand-held stopwatches to time the races. The race was started by the head judge; the judge would do a basic "ready, set, go" and blow the whistle on the "go". Minimum jump heights were 10", and were determined by measuring the smallest dog on the team at the withers and rounding up or down to the nearest inch (so a 13 1/2" dog would jump 13", while a 13 3/4" dog would jump 14"). With the onset of the Electronic Judging System (EJS), which uses lights and infrared timing sensors, competitors were suddenly able to track their starts, passes, finishes, and individual dogs' times to the thousandth of a second. It's hard to imagine racing without an EJS in this day and age. Many teams run all 4 dogs through the course in less than 20 seconds. The NAFA Regular World Record is now 14.433. The NAFA Multibreed World Record is 14.852. NAFA tournaments are divided into divisions so that teams compete against other teams of equal abilities. All dogs including mixed breeds are eligible to compete and earn titles in NAFA sanctioned tournaments. Titles are earned via a point system based on the time it takes a dog's team to complete each heat race. NAFA sanctions over 300-400 tournaments a year across North America. 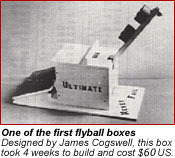 If you enjoyed this little bit of flyball history and would like to read more, visit the Flyball History page, compiled by Jim Sova.